Lock in a great price for Govardhan Bungalow – rated 9.6 by recent guests! We had an amazing experience at Govardhan! The staff was incredibly friendly and helpful, picking us up from the ferry, arranging a day trip for us around the island and even helped us to change our ferry tickets. Dewa was available to answer all of our questions and made it an easy and memorable trip. 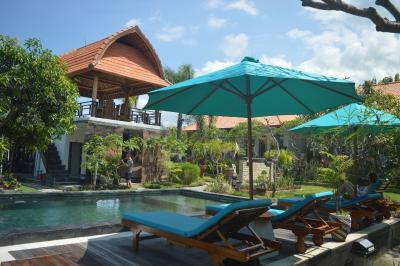 The property was also beautiful and serene, with a lovely pool and lounge area. Our room was clean and well-kept. Super friendly staff. Good breakfast! Awesome that they have scooter rentals available. I would stay here again solely for the fact that the staff was so accommodating and welcoming. I changed my plans last minute to come to Nusa Penida instead, but I never once felt like I was a last minute arrival. They immediately connected through WhatsApp to see if I needed help with transportation, and met me with smiling faces. The location is central and close to the harbor, but a bit farther from the main beaches. For me it wasn’t an issue, as I rented a scooter from the hotel to drive to the beaches (45 min to Atuh Beach to the east and 45 min to the west for Crystal Bay). Lots of nearby restaurants you can walk or scoot to as well. Highly recommend you stay here! New facilities. 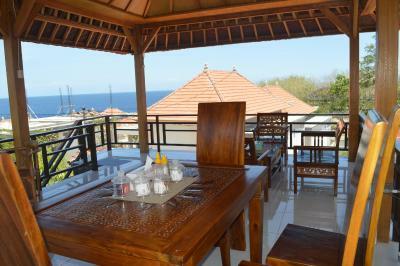 Awesome banana pancakes..Very clean, nice view & pool, perfect for chill out, good location. It is a family business, and they really do care about their customers’ comfort and safety. Dewan,Wayan and all the stuff are the nicest people I met in Bali. You can rent scooter, they also arrange your boat tickets from/to Sanur. We wish we could stay more. If you are planning to go to Lembongan, just go for a day trip. They also pick up&drop you off to the port. Good job guys! 5 star experience. Staff was outstanding, helping us in every way possible. Our stay in Govardhan was supposed to be just a layover and it will be now one of the highlights of the trip. Most warm and welcoming Dewa and Wayan are ready to help you in any possible way you can imagine to make your stay and experience perfect and unforgettable. They anticipate your needs and surprise with kindness in every step. Just a few examples: stretching on the lawn in front of the house in the morning, out of nowhere Wayan brings a yoga mat just in case i decide to upgrade the stretch to a yoga sequence; hungry late in the evening, no problem - a delivery from a restaurant is already on the way; afraid to ride down the scooter on the steep small road, the neighbors already got it down for you :) The new house is great, comfortable bed and immaculate clean. The pool is nice to refresh after a day exploring the island. Breakfast on the terrace with a sea view is amazing. Rooms was nice and extremely clean. Property in general really pretty and well looked after. Dewa and the rest of the family are the most helpful and welcoming hosts you can imagine - starting from transport to arranging a day tour and providing extra recommendations on restaurants and things to do they were the perfect hosts! Excellent service, wont turn you down, while the pool will help you float freely and worry free. the hosts were really nice and the property was beautiful!!! They picked up from the dock and arrangeed are transport to the next location. Also let us use their scooters to go to dinner! Awesome stay thanks Dewa!!!! Govardhan Bungalow This rating is a reflection of how the property compares to the industry standard when it comes to price, facilities and services available. It's based on a self-evaluation by the property. Use this rating to help choose your stay! One of our top picks in Nusa Penida – and a guest favorite. 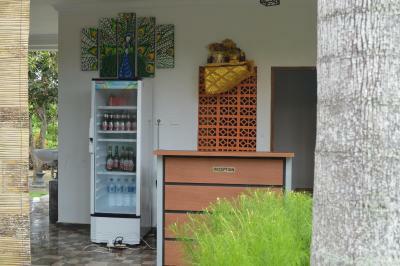 Located in Nusa Penida, Govardhan Bungalow provides free WiFi. The property is around 11 miles from Pulau Seribu Viewpoint, 16 miles from Seganing Waterfall and 1.4 miles from Sampalan Harbour. 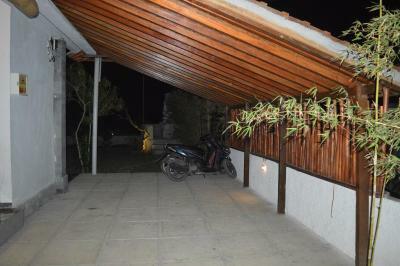 The property offers bike rental and features a garden and outdoor pool. Guest rooms at the guesthouse are equipped with a seating area and a flat-screen TV. Govardhan Bungalow has some rooms that feature pool views, and each room is equipped with a private bathroom and a desk. All rooms include a closet. The reception at Govardhan Bungalow can provide tips on the area. Goa Giri Putri Temple is 2.9 miles from the guesthouse. The nearest airport is Ngurah Rai International, 46 miles from Govardhan Bungalow, and the property offers a free shuttle service. When would you like to stay at Govardhan Bungalow? This twin room has a tea/coffee maker, tile/marble floor and flat-screen TV. This double room features a tile/marble floor, seating area and private entrance. House Rules Govardhan Bungalow takes special requests – add in the next step! 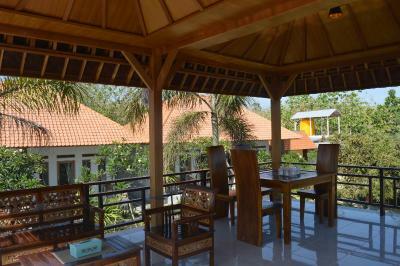 Any additional children or adults are charged IDR 200000 per night for extra beds. Dewa and his staff really were some of the most hospitable people we have ever met. We were welcomed like family. Great communication of any questions we had via whatsapp. We will definitely return on our next trip to Nusa Penida. We also had a beautiful sunrise breakfast! Nasi goreng and pancakes were delicious. Everything is perfect. Nice and clean property. Staff is also very cooperative. Special thanks to Dewa who drive us to the harbour. Beautiful and cosy property. Pool, garden, cute dog and friendly faces. Such comfortable beds and spacious room/toilet. Value deal. It was just perfect. I loved everything. The owner(Deva) is a beautiful soul. Everthing was just awsome. Lovely little place. The owner couldnt be friendlyer, absolut great. Clean and comfortable. He pick us from the harbour and bring us back. Great Service. We come back! We liked everything! No complaints. Everything. Friendliness of personal. Arranging tours. Clean room. Nice pool and gardens. Amazing service and hospitality from the staff who bent over backwards to accomodate with all our needs. The bungalows were immaculate and common areas were beautiful! The hotel doesn't have a kitchen so in the evening you have to go out for food or get a delivery. There were some restaurants around the hotel but not many, however there are plenty restaurants available in a short scooter ride radius. The staff at the hotel was incredibly helpful and very attentive. They arrange a pick up and drop off for us at the dock. They helped us arrange a driver for the day. The rooms were rather simple but very spacious and very clean. The swimming pool was a really nice feature. My favorite part was how nice and attentive the staff was here. They were so welcoming and thoughtful during our entire stay. We were picked up by them at the sea port and upon arrival, they greeted us with welcome drinks. The room itself was extremely spacious and clean. Also the location was close to the beach, however, you can rent a scooter from them at an extremely reasonable price from the bungalow itself to check out the island. Lastly, we REALLY loved the Fried Noodles offered as breakfast there, its honestly the best fried noodles we've had during our entire stay in Bali (I'm still thinking about it). Everything! The staff was fantastic, super clean and very welcoming. The best place we stained in while traveling around Bali, although it was one of the least expansive.